Learn about their ministry, pray for them and give financial support. This database allows you to search for LCMS missionaries, international workers and national (domestic) workers, by last name or by region. You can then click on links to go to their downloadable prayer cards or their online giving pages. 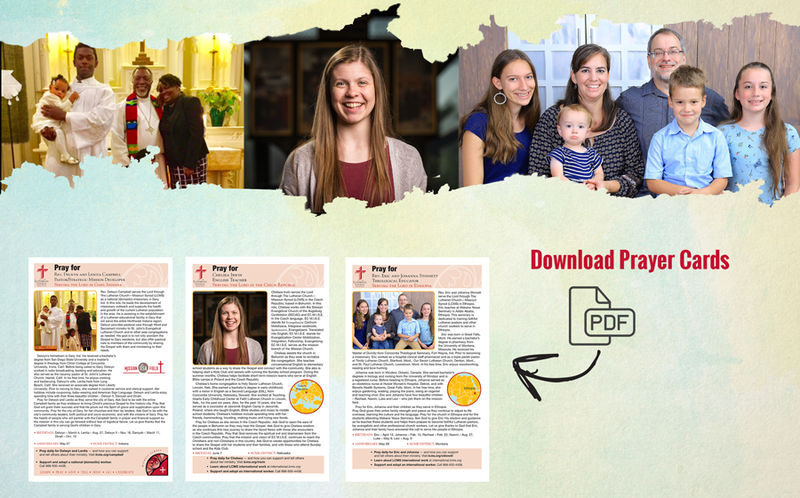 The downloadable prayer card is an easy-to-print document that provides background information and specific prayer requests for each family or individual. The right side of each prayer card is a support form, which can be filled out and mailed in to The Lutheran Church—Missouri Synod to set up ongoing giving towards their service. These prayer cards are great to use as bulletin inserts as well. Each individual's or family's online giving page provides background information and prayer requests, along with a Give Now link to immediately give online towards supporting their ministry or setting up ongoing financial support of them.